CarGurus has 2,602 nationwide CC listings starting at $2,900. Volkswagen makes only a few minor improvements to its CC luxury sport sedan as it nears the end of its current generation. Launched in 2009 and updated in 2012, the CC should see a full redesign in the next year or two—but for 2017, the automaker focuses on paring down the trim offerings and adding a few new safety features and interior design tweaks. The lineup has been shaved to just two available trims and the 280-hp V6 engine is no longer available, leaving the CC with a single turbocharged 4-cylinder powerplant. Volkswagen offers the 2017 CC in just the Sport and R-Line Executive trims, eliminating the Trend, R-Line, and V6 4Motion Executive trims. The Sport gets new ebony and chrome interior trimming, and the R-Line Executive trim comes with new standard safety features like a lane-departure warning system, a forward-collision warning system with autonomous emergency braking, and adaptive cruise control. In addition, the automaker has updated its Car-Net app to better integrate with the MIB II infotainment system. Standard features that roll over from 2016 include leatherette upholstery, heated 12-way power-adjustable front seats, push-button start, and dual-zone automatic climate control. Though it's starting to show its age and could use a design refresh, the CC still looks clean and sporty, especially up front. The grille and high-intensity discharge (HID) headlights are seamlessly integrated, and a wide, flat hood gives rise to a low cabin line that sweeps back to a contoured rear end and LED taillights. All in all, it's a subtle and classy look, though it does little to help the CC stand out against competitors like the Lexus ES 350, Acura TLX, or Genesis G80, who go to great lengths to impress buyers with their eye-catching designs. Power for the 2017 CC comes exclusively from a turbocharged 2.0-liter TSI 4-cylinder engine, which churns out 200 hp and 207 lb-ft of torque on premium fuel. Those are reasonable numbers, though the more expensive G80 makes a minimum of 311 hp with its base V6 engine, and the ES 350’s V6 has an output of 268 hp. The CC’s turbo mates with a 6-speed Tiptronic automatic transmission with a manual shift mode, and the R-Line trim adds steering-wheel-mounted paddle shifters. Fuel-economy numbers check in at 22 mpg city, 31 highway, and 25 combined, which, while not overly impressive, are about average for the class and for a turbocharged powerplant. The CC rides on a front-wheel-drive (FWD) platform, which means it doesn't have the handling characteristics of rear-wheel-drive (RWD) sport sedans like the Cadillac CTS, Genesis G80, or Infiniti Q70, not to mention class stalwarts like the BMW 5 Series. Still, the CC's sport-tuned suspension, while somewhat firm, delivers a balanced and comfortable ride that won't shake up passengers on bumpy roads. The low, coupe-like ride height adds to the car's sportiness, and the electro-mechanical power-assisted steering offers an overall precise feel—although some critics would like to see a little more feedback and a better response. On the interior, the 5-passenger CC gets high marks for its comfort and high-quality materials. The front seats provide plenty of support, legroom, and headroom, although taller passengers might feel a little cramped in the rear seats due to the tapering roofline. The CC comes with a 60/40-split rear seat, a center armrest with storage, and a pass-through from the trunk. Cargo space checks in at 13.2 cubic feet, which is about average for the class, although less than the G80’s 15.3 cubic feet or the ES 350’s 15.2 cubic feet. In addition to upscale appointments like leatherette upholstery and heated front seats, the CC Sport trim comes standard with a leather-wrapped steering wheel, an auto-dimming rear-view mirror, a 6.3-inch touchscreen, navigation, a reversing camera, and an 8-speaker audio system with SiriusXM and HD Radio. The R-Line Executive trim adds leather upholstery, ambient lighting, and stainless steel R-Line scuff plates. The R-Line Executive trim further distinguishes itself from the Sport with a flashier front end, displaying a gloss-black grille, a bolder lower air intake, unique fog lights, sport bumpers, and side sills. It also rides on larger 18-inch wheels, compared to the Sport’s 17-inchers. Both trims get power-adjustable side mirrors with integrated turn signals and rain-sensing windshield wipers with heated washer nozzles, while the R-Line Executive trim adds heating, memory, and auto-dimming functionality to the side mirrors. Along with the expected antilock brakes (ABS), electronic stability control, and full set of airbags, the CC comes equipped with the automaker's Car-Net Security & Service suite. This system lets owners access their vehicle remotely via an app and provides diagnostic, maintenance, and family-safety features like a speed alert and the ability to preset the maximum speed. Other safety tools available through Car-Net include automatic crash notification, roadside assistance, and a stolen-vehicle locator. Overall, the CC offers plenty of upscale features at a relatively affordable price, especially when compared to other vehicles in the class. While its stylish design is a little dated and it lacks some of the performance punch of similar sport sedans, the CC is a competent daily driver with a comfortable, well-equipped interior and decent handling. Prospective buyers will want to check out the competition as well, but they’ll no doubt find that the CC offers a lot of bang for the buck. 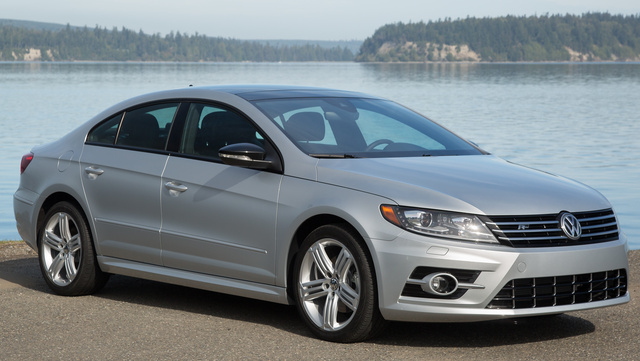 What's your take on the 2017 Volkswagen CC? Have you driven a 2017 Volkswagen CC?